Russian Fermented Tomatoes literally translate to ‘Salted Tomatoes’ in Russian, as they are make in a salt brine. The Russian way of pickling doesn’t traditionally involve vinegar, but some recipes add vinegar too now, especially if you are going to be canning them for the winter. My tomato recipe is called Fermented Tomatoes (Квашеные помидоры), but this is interchangeable with Pickled Tomatoes, or Salted Tomatoes, it’s all called kind of the same thing in Russian, but with slightly different names, and slight differences in process. I know, confusing, but there are many ways to prepare this. This is a simple recipe, water, salt, herbs and spices, that’s it. You don’t even need to use hot water, but I still do. I like fermented foods and the health benefits they provide. This recipe is along those lines, providing a great way to preserve your tomato harvest. They are so delicious, but can be an acquired taste. As a kid, I hated eating these, because they were usually so fizzy and fermented. I couldn’t eat them. I think I prefer a more milder version, so they taste fresher. 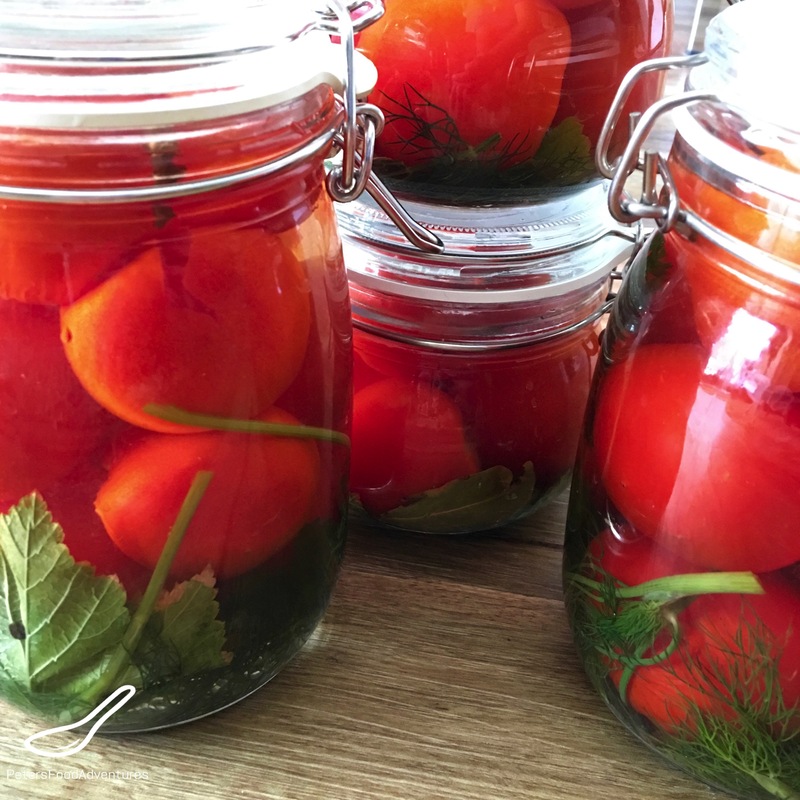 If you want to can your tomatoes, see my Russian Pickled Tomatoes for the process. Fermented Tomatoes is a traditional Russian recipe. The brine in Russian is called rassol, which is also popular hangover cure in Russia. It’s full of sodium and electrolytes which makes it popular I suppose, but that’s not the reason to make this recipe. The rassol is also used to make a soup called Rassolnik (рассольник). Traditionally this is made in large 3 Litre glass jars, but as I am keeping this in my fridge and not canning them or keeping in a cellar, I’m using 1 Litre jars from Ikea. You’ll need to adjust the salt if using the larger jars. The amount of brine needed will depend on how many items you stuff into the jar, so its critical to get the salt content right. For a 1 Litre jar, you need at least 15 grams of salt, which is 3 teaspoons. Be generous with your teaspoons, don’t be stingy, as you’ll have some brine left over from the filling. And I also add 1 teaspoon of sugar to the brine. Historically, salt has been used to preserve foods, so having the correct level of salt will ensure the tomatoes are preserved correctly. The brine will taste quite salty, but don’t worry, tomatoes love salt and it will mellow and combine together perfectly. Black currant or horseradish leaves are optional, but I always add in the currant leaf, as I can’t find fresh horseradish here in Perth. Also it’s very important to use salt with no additives, without anti-caking agents or added iodine. Just use 100% pure salt. It’s an acquired taste, but all fermented foods are. I love to eat Fermented Tomatoes as a condiment with Plov, with potatoes, or even just on the table with whatever I’m eating! Bon Appetit! Приятного аппетита! Very interesting Peter! Lovely looking! Thanks! So many ways to eat tomatoes! Great looking photos and recipe! Thanks! And thanks for checking it out! When the tomatoes are eaten, can more tomatoes be put into the brine? Hi Sue, that’s a great question. I’m honestly not sure as it’s something that I haven’t done before, as I try to be cautious with fermented foods. I just make a new batch, but other people think it might be possible. Here’s some more info on another site that might help. http://www.wellpreserved.ca/fundamentals-fermentation-can-re-use-brine/. Hope this helps. ???? These are absolutely wonderful. I’ll be making more tomorrow. The main problem I’m having is the waiting time. Mine have not made it to the refrigerator. I have several batches on the counter now. They are disappearing. 🙂 Also, these are so beautiful in the jar. They look like a decoration. Thanks for your compliment! We love them too, I know what you mean about the waiting!!???? Hi Esther! Thanks for asking! The tomatoes are usually whole and not quartered. The recipe is per jar, depending on the size of it. This recipe is for a 1 litre jar. I love lots of garlic and dill and always use lots. If you have a larger jar, simply use more herbs and spices. ???? Thank you so much for this recipe! I didn’t have black current/horseradish leaves, so I couldn’t add those, but otherwise followed the recipe. I used my Probiotic Jar so I wouldn’t have to worry about mold. The fermented tomatoes are delicious! This is now the only recipe I will use!